Our Chiropractic team utilizes manual adjustments with exercise prescription to restore correct spinal and peripheral joint mechanics in order to reduce pain and improve function. Besides manual adjustments and mobilizations, we use trigger point therapy, myofascial release, shockwave therapy, acupuncture, electro acupuncture, gait analysis and custom orthotics, metabolic support, rehabilitative and fitness based exercise prescription and postural reeducation. Treating patients on an individualized basis to meet their specific needs. Every treatment is symptom dependent and varied based on the current symptoms. Contemporary Medical Acupuncture is the evidence based application of the traditional theories of acupuncture combined with the current concepts of neuroanatomy, neurophysiology & pathophysiology. Combining ancient Chinese principles with modern science in order to relieve acute pain, alter movement, and improve function. It involves the insertion of very fine sterile disposable needles in specific points on the body to access different physiological responses. Acupuncture points are carefully determined based on your specific injury and symptoms targeting the muscles and nerves that are causing the pain or dysfunction. Electro Acupuncture is the method of attaching acupuncture needles to a device that generates a mild but continuous electrical pulse. Electro Acupuncture is extremely effective as it stimulates a larger region surrounding acupuncture points, increases blood circulation, relaxing spastic muscles, and releasing painful trigger points. Chiropractors are trained to correct poor joint mechanics and joint misalignments. Chiropractic treatment of the TMJ focuses on joint mobilizations, adjustments and soft tissue techniques applied directly to the TMJ and its surrounding musculature. In most cases, TMD is influenced or exacerbated by poor joint mechanics, and tight musculature in the upper back and neck. Therefore, of equal importance, treatment also focuses on corrections to the mechanics and positioning of the joints in the upper back and neck to relieve symptoms associated with TMJ dysfunction. When these treatments are employed, motion of your upper back, neck and jaw joints can improve and your symptoms such as: ear pain, jaw locking, headaches, and neck pain can be reduced or eliminated. Physiotherapy involves the rehabilitation, prevention, and management of musculoskeletal conditions to restore, maintain, or enhance movement, function or performance associated with athletic or everyday injuries both acute and those caused by repetitive strain. *Providing One-on-One Physiotherapy Treatments, Manual Therapies, Myofascial Release and Rehabilitative Exercise Prescription. *Concussion Management & Rehabilitation: Trained Provider of the Shift Concussion Management Program Dante Biscaro MSc PT, BHK. Qualified to administer the ImPACT TEST (Immediate Post-Concussion Assessment and Cognitive Test), Concussion Baseline Testing For Athletes. WOMEN’S SERVICES: Urinary Incontinence, Pelvic Organ Prolapse, Pelvic Pain, Prenatal Care & Postpartum Recovery. WOMEN'S PELVIC HEALTH: To Kegel or NOT? PELVIC FLOOR DYSFUNCTION can be diagnosed by physiotherapists with specialized training using internal & external manual techniques to evaluate the function of the pelvic floor muscles, also assessing the ability to contract and relax these muscles. The bones and muscles of the low back, hips and Sacro-iliac joints (SI Joints) will also need to be assessed since these joints can stress the pelvic floor muscles. DIASTASIS RECTI: Is the separation in the rectus abdominis or "6 pack" muscle, most often occurng during pregnancy. If you can lift your head while lying on your back and the centre of your stomach protrudes out, you may have what is called rectus diastasis. It is measured by the number of fingers you can fit between the muscle when lying on your back and lifting your head. WHY IS IT IMPORTANT? Your abdominals work with your pelvic floor, therefore a separation of the rectus abdominis/core muscles can make the pelvic floor less efficient and may also contribute to incontinence and pelvic organ prolapse. Corrective exercises are recommended. Shockwave Therapy or (ESWT) treatments are non invasive and promote accelerated recovery from chronic injuries. 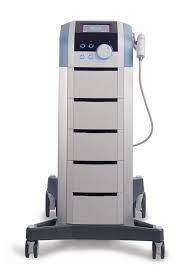 Extracorporeal Shockwave Therapy is often used in the treatment of musculoskeletal conditions involving connective tissues such as ligaments and tendons, as well as bone, heel and joint pain.